Already registered? Read participant information. If you have any questions, please contact Rob Tapper at  robert.tapper@umontana.edu. 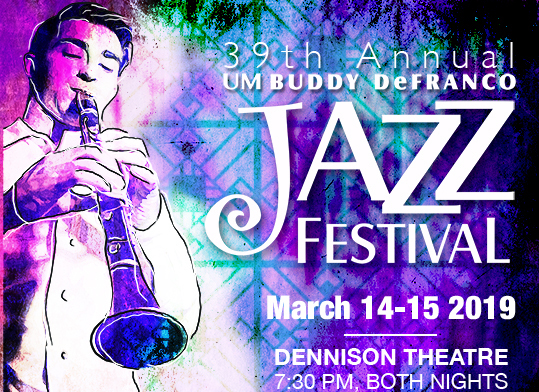 The University of Montana College of Visual and Performing Arts in conjunction with the School of Music is proud to announce the 2019 edition of the UM Buddy DeFranco Jazz Festival which will occur on March 14-15, 2019. The emphasis of this instrumental and vocal jazz festival is on education, improvisation and the jazz language. The 2019 Festival Artists will include the talent of Doug Stone (saxophone), Brian Claxton (drum set), Matt Harris (piano), Aric Schneller (trombone), Ashley Summers (bass) and Steve Roach (trumpet). 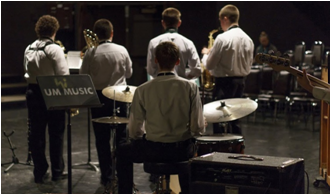 On both evenings, experience a spectacular musical event with the High School Best Section Big Band and outstanding soloists from the daytime events along with more musical artistry. The fun and learning continue throughout each day with clinics, ensemble critiques, workshops, open rehearsals and master classes with guest artists, local musicians, and faculty from the University of Montana. The UM Buddy DeFranco Festival promises to be an exciting opportunity to learn more about the language of jazz and a great weekend of music and jazz education.